ابرقویی فرد, حمیده. (1395). بررسی طرح احیای محدوده حفاظتی بارانگارو. مجله علمی-ترویجی منظر, 8(37), 66-75. حمیده ابرقویی فرد. "بررسی طرح احیای محدوده حفاظتی بارانگارو". 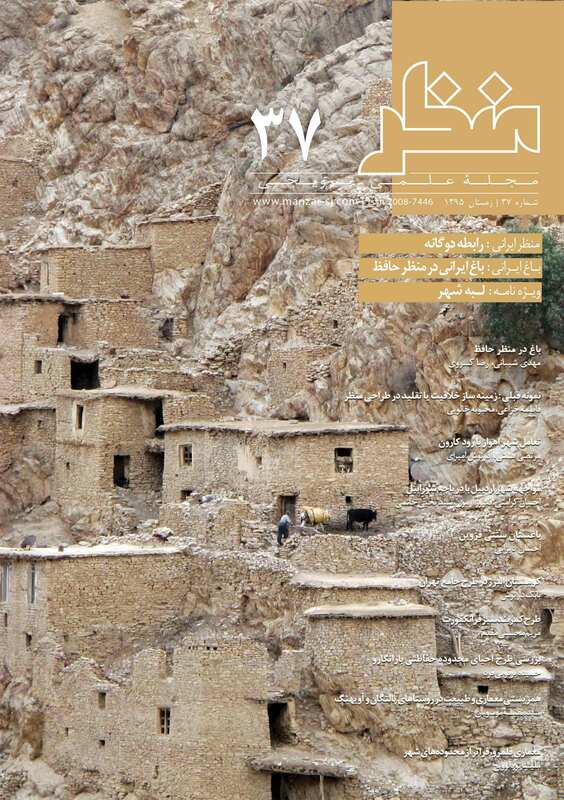 مجله علمی-ترویجی منظر, 8, 37, 1395, 66-75. ابرقویی فرد, حمیده. (1395). 'بررسی طرح احیای محدوده حفاظتی بارانگارو', مجله علمی-ترویجی منظر, 8(37), pp. 66-75. ابرقویی فرد, حمیده. بررسی طرح احیای محدوده حفاظتی بارانگارو. مجله علمی-ترویجی منظر, 1395; 8(37): 66-75. گروه معماری منظر، پردیس هنرهای زیبا، دانشگاه تهران. A city shape reflects a historical interaction between human and his natural environment, and human perception of this natural context is urban landscape. In this view, study of historical and natural layers of landscape and human impacts on them, gives us the opportunity to understand and represent landscape in a more developed way. Sydney, in Australia is one of the remarkable examples of seaside cities. Influenced by the historical interaction between Sydney and Tasman Sea, the Barangaroo reserve restoration plan is a subset of human's relationship with nature and includes restoring promontory’s natural shape in pre-industrial era in a symbolic way. The measures taken in this regard consist of rewriting the historical characteristics of the site in objective way, including morphological features of the natural context, and in a subjective way such as the restoration of the local culture. Although the industrial background of the Barangaroo promontory plays a key role in its evolution from a natural edge belonging to the native Australian tribes to an industrial edge to the 21st century, it should be noted that the purpose of urban landscape is to democratize public areas based on the dynamic essence of landscape. If urban landscape required by the Sydneysiders would be a space for linking city to nature far from its industrial harbors, shedding industrial maritime heritage will be acceptable, in favor of the naturalistic approach of the landscape architect, Peter Walker. This historical return to pre-industrial morphology reconnects citizens and nature and also leads to connection of the city to a natural edge instead of continuous urban industrial context. with provided natural conditions, such as indigenous planting and morphological recreation in the form of sandstone blocks and reviving naturalistic native culture, Sydney’s identity, in addition to being a harbor and industrial city, will be upgraded to the connection of nature and industry, concrete and sandstone, native and modern culture, and at last society and history through naturalistic landscape. حبیبی، امین. (1392). طبیعت زیباست؟ تأمل در فلسفه زیبایی طبیعت. مجله منظر 5(22) : 40-43. حبیبی، امین. (1390). نقش منظر در روند تعادل بخشی به محیط و پایداری توسعه در محیط‏های انسان ساخت. رساله دکتری. تهران : دانشگاه تهران. ردایی، سارا. (1390). نگاهی به رویکرد پساصنعتی لاتز. مجله منظر 3(16) : 26-33. مک‌هارگ، ایان. (1386). طراحی با طبیعت. ترجمه : عبدالحسین وهاب‌زاده. مشهد : انتشارات جهاد دانشگاهی. Barangaroo (n.d). Available from: http://www.pwpla.com/barangaroo (Accessed 20 May 2017). Barangaroo Reserve in Sydney, the design of a life time Landscape (n.d). Available from: http://www.barangaroo.com/(Accessed 20 May 2017). Cheng, L. (2015). Rewriting history: Barangaroo Reserve opens. Available from: http://architectureau.com/articles/barangaroo-reserve-opens-to-public/ (Accessed 20 May 2017). Leigh, G. (2016). Peter walker’s point; the barangaroo reserve transforms Sydney harbour’s old industrial landscape. Landscape Architecture Magazine, 106(11): 78-134. Linderman, M. (2011). Ten design lessons from Frederick Law Olmsted, the father of American landscape architecture. Available from: https://signalvnoise.com/posts/2919-ten-design-lessons-from-frederick-law-olmsted-the-father-of-american-landscape-architecture (Accessed 20 May 2017). Naveh. Z. (1998). Ecological and Cultural Landscape Restoration and the Cultural Evolution towards a Post-Industrial Symbiosis between Human Society and Nature. Restoration Ecology, 6(2): 135-143.